Teamwork continues to be the focus in the second phase of the BIREME/PAHO/WHO training series. The most recent training was carried out outside of the Center’s facilities, and all employees participated in the reflection and discussion of themes and actions that characterize high-performance teams. The staff consists of thirty-six employees linked to the Hospital São Paulo/ Associação Paulista para o Desenvolvimento da Medicina (HSP/SPDM) and the Pan American Health Organization/World Health Organization (PAHO/WHO). 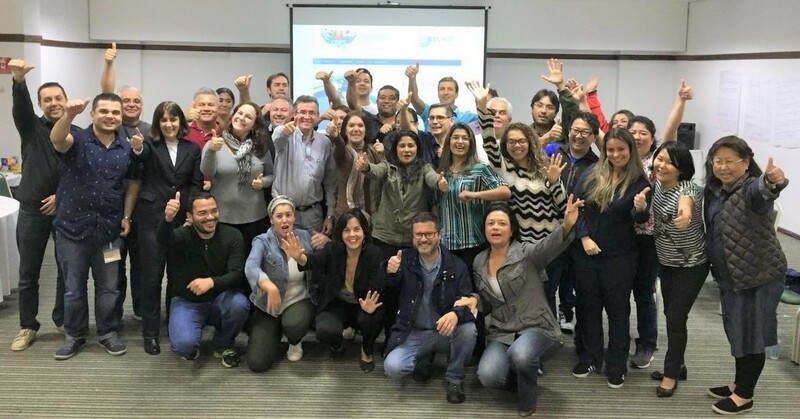 The training was supported by PAHO/WHO Human Resources Department and was conducted by external consultants on June 14, keeping the objective of continually integrating BIREME teams, encouraging alliances of high-performance teams. After all, although each employee has a different field of action, be it in technical or administrative areas, everyone contributes to the delivery of projects, products and services developed by BIREME on scientific communication and information and knowledge management, which are made available to all Latin American and Caribbean countries, with the objective of improving access to information and scientific evidence in health. The importance of giving and receiving constructive feedback for the development of skills and the alignment and improvement of processes and results was one of the most dynamic activities, considering the importance of ideal approaches in the workplace, verbal and non-verbal communication, among other elements. Collaborators Karine Kiryu, Director’s Assistant, and Kleber Alves, IT Infrastructure Analyst, both recently hired, shared their perception of the activity. Karine considered the training to be very dynamic and integrative, searching interaction with all BIREME personnel. Kleber also considered the training dynamic and that it added knowledge, integration among teams, good practices for teamwork and feedback through global approaching techniques, transmitted for the objective to be reached in the most effective and correct manner, aligned with the expectations of the proposed work. The Human Resources Assistant, Jobar Farias, highlighted the importance of internally developed training programs, which help integrate managers and collaborators to the organizational procedures at the same time it develop their abilities. Silvia de Valentin, Administrator, pointed out the importance of constantly developing individual and collective skills, which has a positive impact on the results achieved, as well as meeting agreed-upon deadlines. Finally, the team produced a motivational video in recognition to the results achieved in the last two years. Overcome challenges, opportunities, strategies, results, achievements and main lessons learned were thus portrayed in a creative and entertaining way. It is worthy noting that BIREME received and institutional PAHO/WHO Award for Outstanding Team (see article) for its results in the 2016-2017 biennium. The award ceremony took place on June 26, in PAHO/WHO Headquarters in Washington D.C., United States. Cícera Maria dos Santos, Administrative Assistant, was chosen internally to represent the BIREME/PAHO/WHO team.